Discounts & Rewards - Perelandra Ltd.
All new customers will receive a coupon with their first shipped order for $5 off their next order. For all folks over 65, we offer 10% off the subtotal of your order. Not combined with sales. We occasionally offer special discounts. When a special is available, it will be posted on the home page of our website. We also send email announcing the special to folks who are signed up for our EarthSave email list, and we post a note on our Perelandra Facebook page. These events often include a bunch of great specials and free gifts. They are announced on our home page, on Facebook and through our EarthSave email. Learn more about our Virtual Open Houses here. In support of your service, we offer a 25% discount on Perelandra Essences and Solutions for all military and emergency personnel, as well as to those folks working in ongoing relief efforts at home and abroad. To request this special discount, please add a note to your order telling us your service position. Note: We also offer discounts and additional considerations to those folks directly impacted by the devastation of a natural disaster such as fire, earthquake or flood. If you have been hit by a natural disaster — just call or email and we will help. We are deeply appreciative when you feel strongly about what we have to offer and pass the word along to family and friends. As a thank you, we send you a gift when your friends make their first order with us: a 1/2-oz. 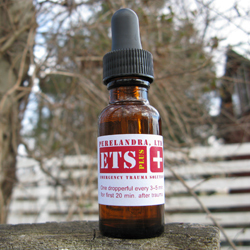 bottle of ETS for Humans. If you're submitting your first order online, be sure to add a note to your order letting us know who told you about Perelandra! The ongoing discount offers listed here cannot be combined with special offers. For sale items, you get the better of the qualifying discounts.